Omg, I love this game! 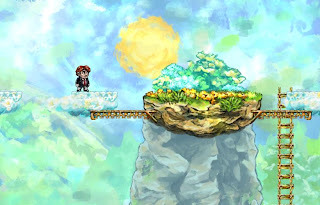 I was afraid that I'd get bored during the exam period, but luckily I decided to install Braid. It's a 2D game, that focuses on manipulating time to solve puzzles. The gfx are really simple and the main character looks kinda plain, but that doesn't bother me. I really like the soft style used for the backgrounds, they remind me of watercolour paintings. Look how pretty. ^^ Right? Some of the puzzles are simple, others are very challenging. Should keep me busy for a while.